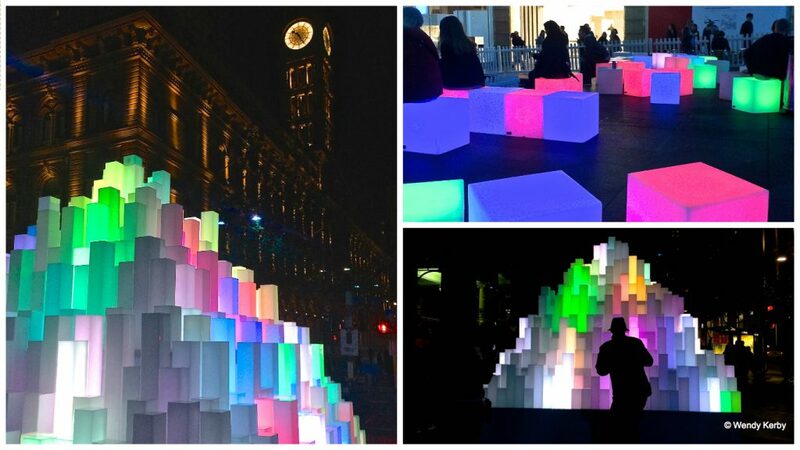 Visiting the Vivid Festival in Sydney is a must if you are planning a visit to the city in winter. 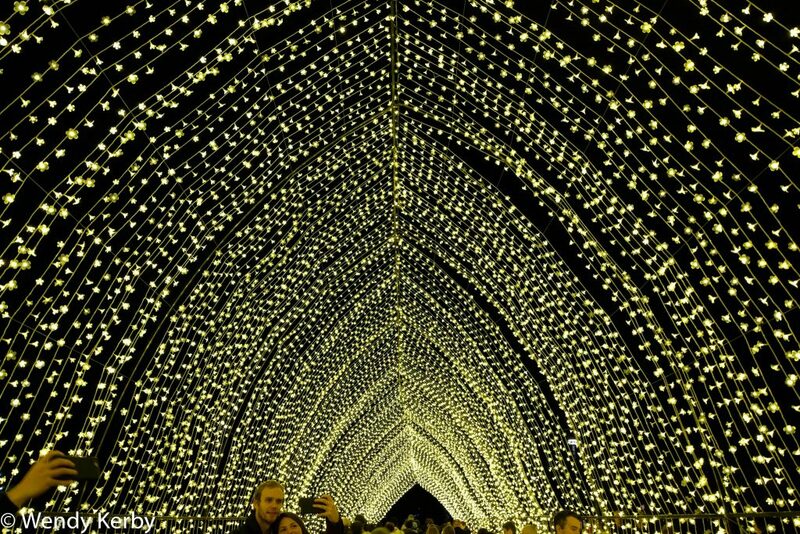 The festival of light, music and ideas runs nightly over three weeks, transforming Sydney into a light spectacular once darkness falls. 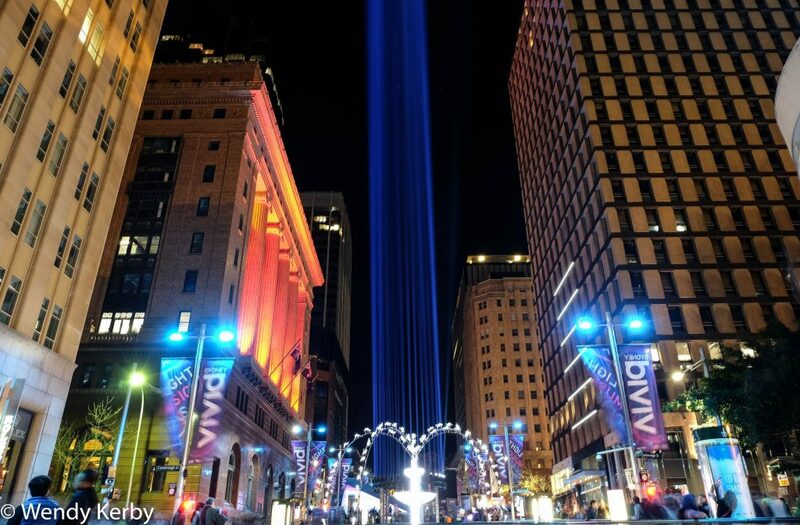 Vivid is an annual event that brings art, culture and music to the fore with innovative, thought provoking and mesmerising displays. For three weeks around the Queens birthday long weekend, Sydney becomes amazingly Vivid. 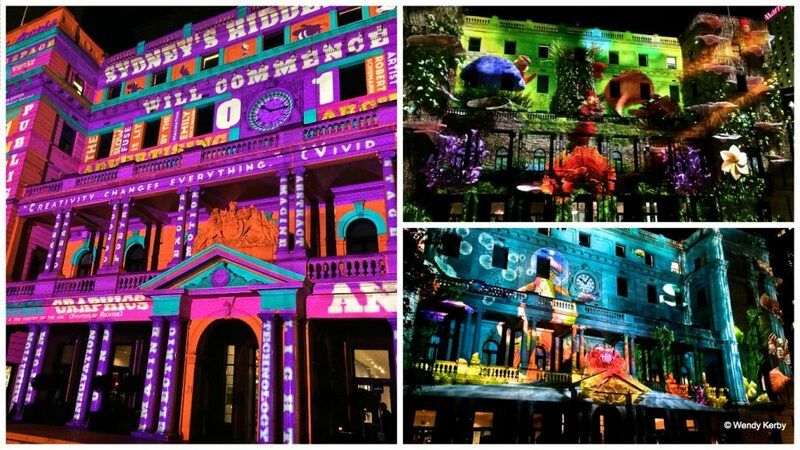 The Vivid festival has been running for 8 years now and with each new year it just gets bigger and better. 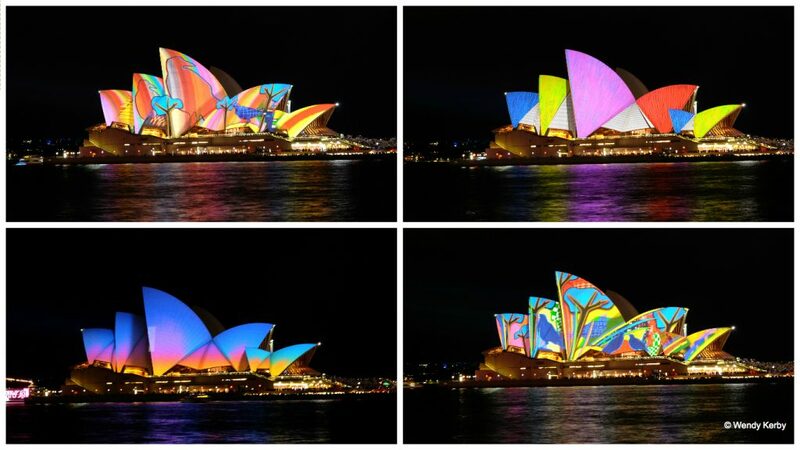 This is no ordinary light show, you will see many projections of a large scale, including the lighting of the sails of the Opera House. There are 90 light events, 42 music events and 14 idea events from cutting edge designers around the world. This event is completely free for the public to enjoy. Lights are on at 6pm and continue to 11pm each night. By far, the three Saturday nights are the busiest and if you have a few days in Sydney, then it would be best avoid Saturday night if you don’t cope with crowds. 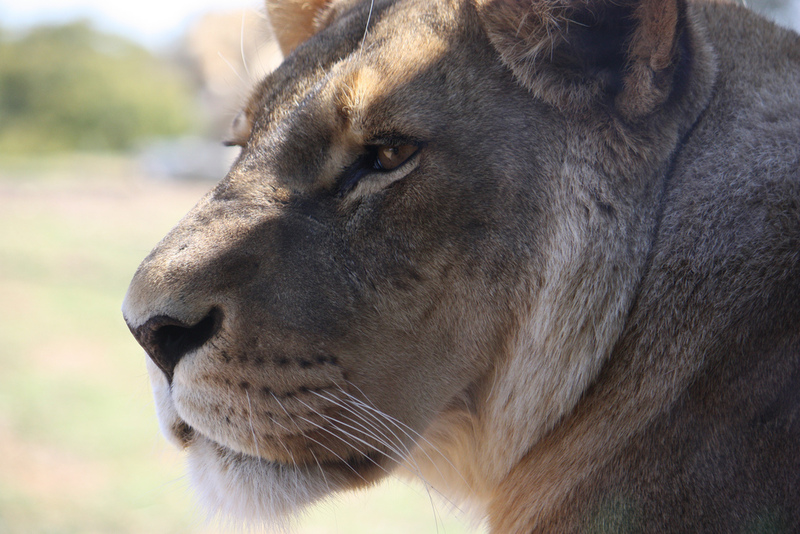 It is busy at all hours, but particularly around 6-9 pm when families with younger children are out and about. The busiest displays are the Cathedral of Light and the area in front of the Museum of Contemporary Art, where the crowd flocks to view the Opera House projection display. If you want to check out the Cathedral of light, it is best to get there early around 6-7pm, where crowds can move through quickly. Once the crowd builds you may be waiting up to 30 minutes to enter, as there is a crowd control, limiting the number of people walking through the tunnel. If you want to get some photographs of the Opera House without navigating the crowd, walk around Circular quay and from the Rocks side, enter from Argyle Street or any of the streets further on. This way you will miss the crowd walking at a snails pace to the harbour’s edge. 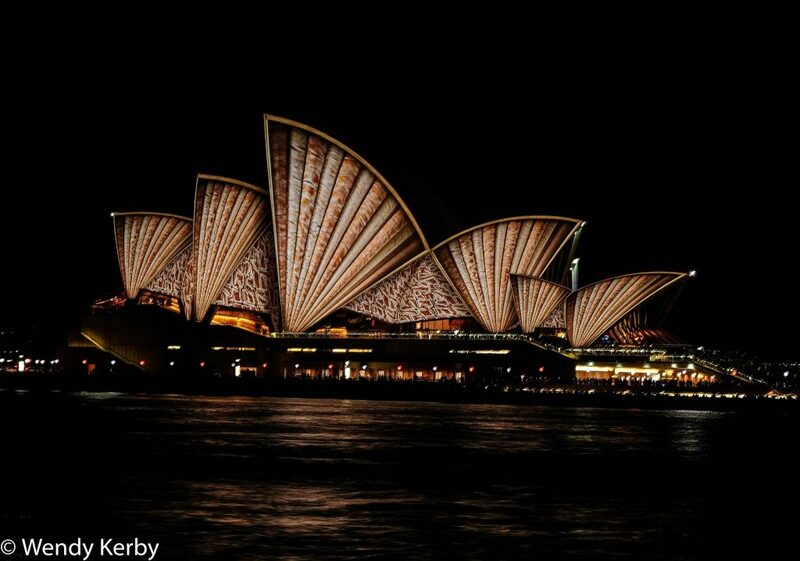 The Sydney Opera House Lighting the Sails this year features an indigenous theme “Songlines’. It celebrates Australia’s first nations spirituality and culture through the songlines of the land and sky. This year’s Lighting the Sails is about painting and celebrating this country through a pattern of sharing systems, interconnected history lines and trade routes. I LOVE YOU is a giant illuminated heart-shaped ‘Love-O-Meter’, that requires the participants to yell loudly “I love you” into the microphones. This is a funny take on love declarations and often the crowd will “love you back”, well they did for me as I was standing there on my own yelling madly I love you! 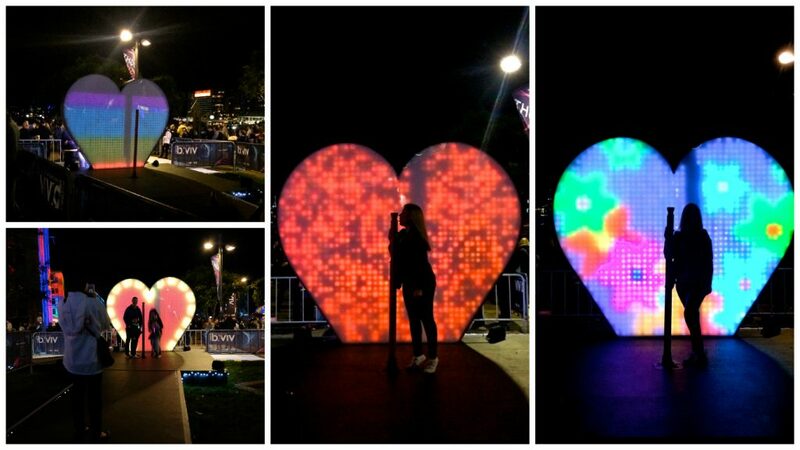 The louder your declaration the more loved up the giant heart will be in order to light up! The people at vivid are only too happy to capture the moment on your iPhone or camera. The light walk along the botanical gardens begins with the cathedral of light. The Cathedral of Light is inspired by traditional arched windows, found in historic churches, to create a 70 metre long tunnel. 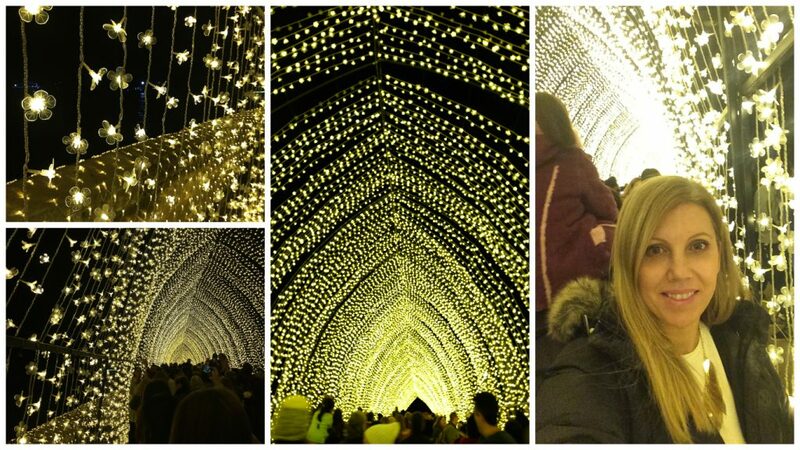 The tunnel is illuminated by tens of thousands of LED light globes. It’s quite a magical walk through the arch of lights, especially if you are lucky to wander through on less busy week night. Once throughout the tunnel, you are then invited to take the walk of light further inside the botanical gardens. The trees within the gardens become show pieces with mystical glowing entities known as the Will O’ the Wisps, sprawling beneath. 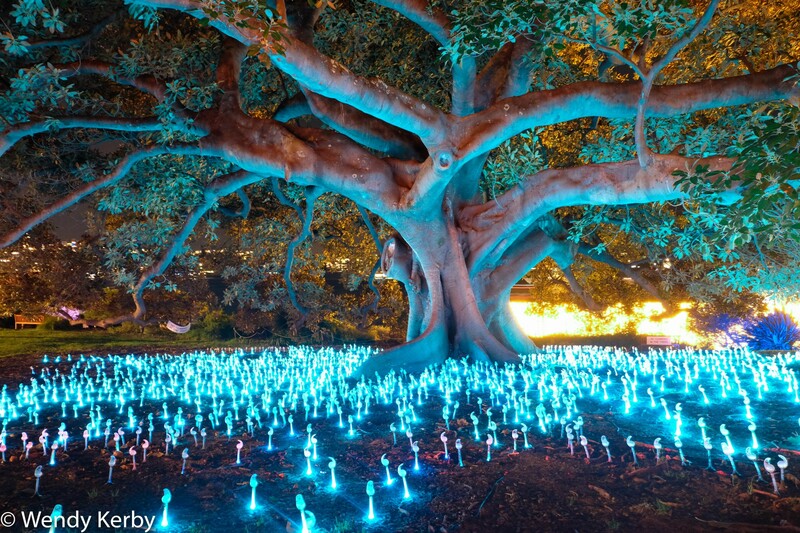 In the dark, these glowing wispy forms disappear and then reappear in many different colours. The ‘wisps’ draw their energy from folklore and legends born from every corner of the world: they are known as fairy fire by Welsh travellers, as Aleya by Bengali fisherman, as luces del tesoro in Mexico and as min min lights in Australia. A Matter of Painting, The Museum of Contemporary Art Australia (MCA) is transformed into a huge canvas on which the energy of the creative process is playfully explored. Together, the artists create an illusion that the façade is actually being carved, painted, cut and brushed. It’s strangely peaceful to watch as the facade drips into each new canvas. 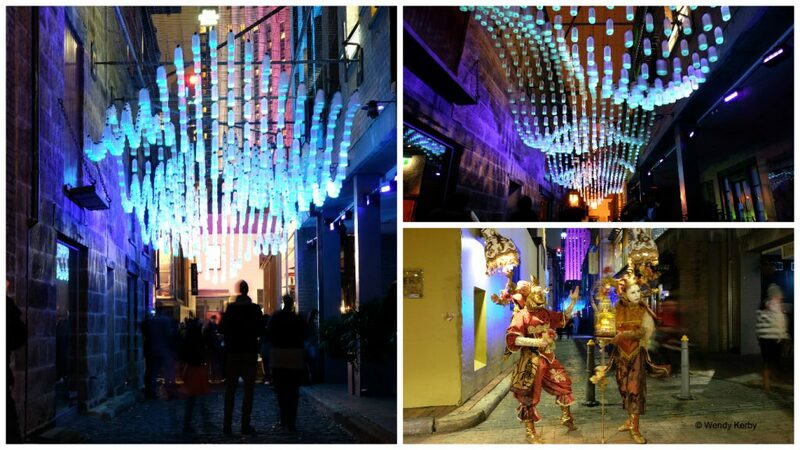 Tectonic is a sustainable lighting installation suspended above a lane way located in the Rocks. The ever swaying display is made up of 1500 PET bottles that have been filled with tonic water. The quinine in the tonic water interacts with invisible ultraviolet rays, giving it a luminescent blue glow. 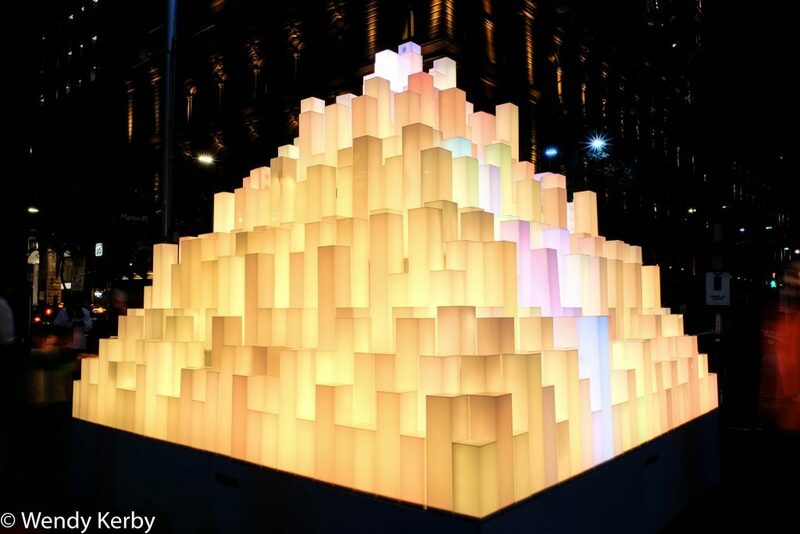 This Mountain of Light is a monolithic installation, of around 4 meters high that goes through a repertoire of colours. Each column can light up in various colours and the depth and amount of colour can be controlled by the viewer. The display Geometrics, has 32 moving lights placed on a high circular truss; the lights create striking effects, projecting columns of light into the night and forming dancing shapes decorative shapes and geometric pattern designs. 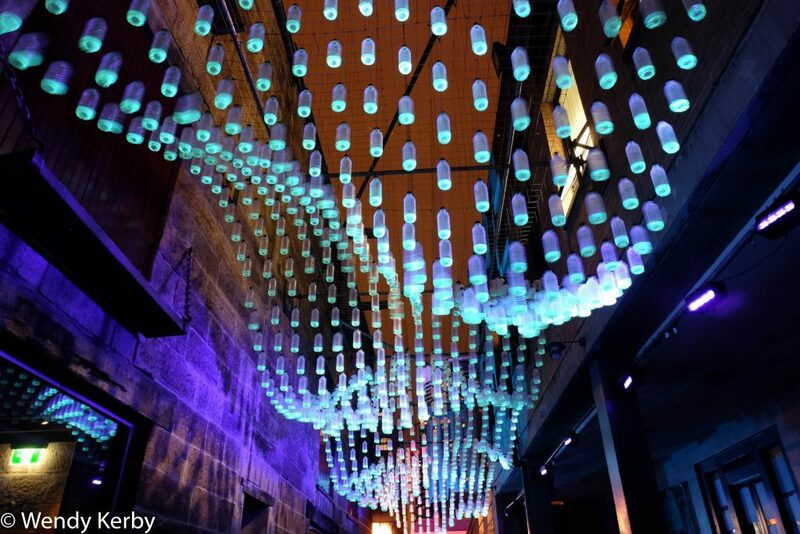 The above are just a highlight of what you can see at Vivid, with many more displays right throughout Sydney. 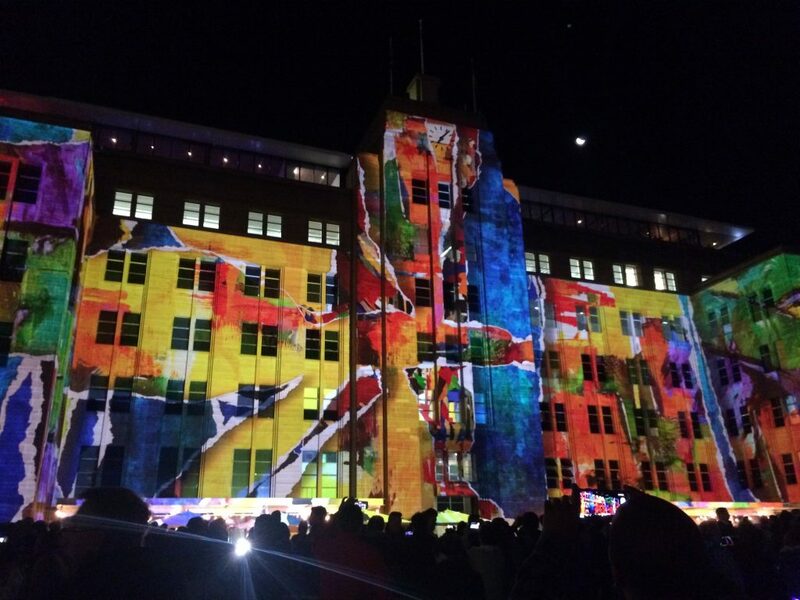 The 2016 Vivid Festival runs between May 27th to June 18th. Another great article Wendy. I especially love your photo of the lights under the tree. It kind of reminds me of the beautiful little tea lights they place at Petra on selected nights. Thanks for sharing. The tree really does look magical Wendy. You’ll totally love Petra. They hold the evening tea light tour three nights a week as I recall. I went in January (it snowed in the hills above) so there weren’t many people. It was amazing to follow all those beautiful little lights down the siq and then emerge at the Treasury building… Don’t miss Wadi Rum and Aqaba while you’re in the neighborhood too. Thanks for the tips and painting a wonderful picture Dale! Hopefully I get to do this one day soon!